Explanation: A planetary nebula with a simple symmetry familiar to telescopic sky gazers, the Ring Nebula (M57) is some 2,000 light-years away in the musical constellation Lyra. Hints of changing colors and subtle details are brought out in this remarkable sketch of the cosmic ring. The sketch was made with 800x magnification and excellent seeing conditions directly at the eyepiece of a 40 inch reflecting telescope. Colored pencils on white paper were used to create the original drawing, shown here digitally scanned with an inverted palette applied. About one light-year across, the nebula is composed of outer layers expelled from a dying, once sun-like star. Intense ultraviolet light from the hot central star ionizes atoms in the gas and powers the nebular glow. Ionized hydrogen adds a reddish tint. Ionized oxygen produces a characteristic blue-green color. 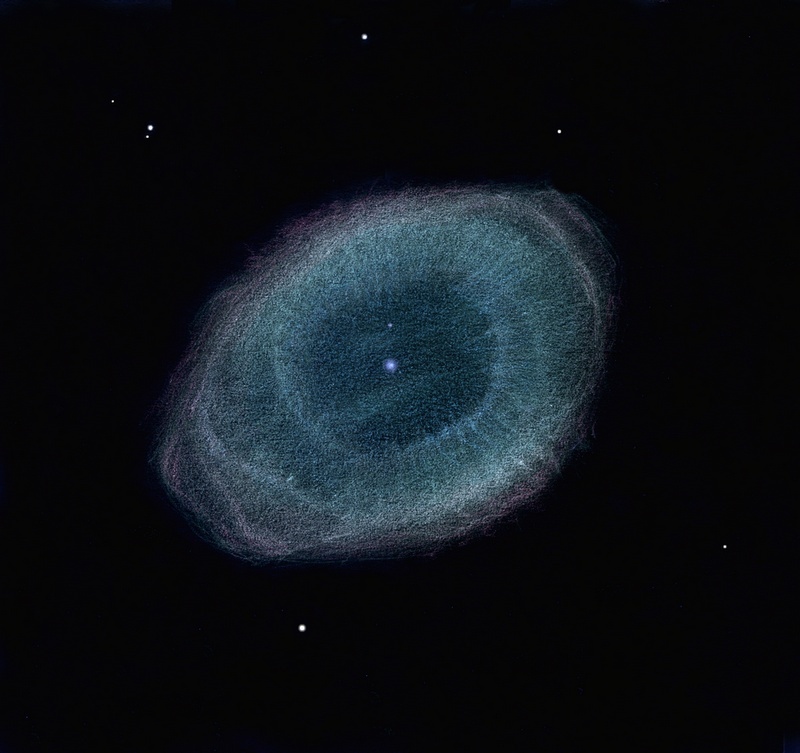 Difficult to see under average conditions with small telescopes, the Ring Nebula's central star was visible at all times during the artist's study.